Noticed for her progressive leadership style and friendly nature (she has the best laugh! ), Katie was promoted to Principal of FLVS Full Time where she led the school to success earning high scores in state evaluations. Her hard work and strong desire to see all students learn culminated in January 2016 when she was promoted to FLVS Full Time Director of Instruction. The role of Director of Instruction requires that Katie wear many hats – offering her the opportunity to have a significant impact on instructors, staff, and students. 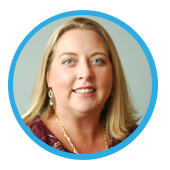 She ensures the high quality of FLVS programs and collaborates with the leadership teams on innovations that will improve the quality of education. I am honored to share with you my interview with Katie Santana! What brought you into the field of education? My mother was a teacher, but it wasn’t something I really ever thought I would follow her into. After graduating with a Sociology degree from Florida State University, I pursued a job teaching in the county I grew up in, and once in the classroom, I fell in love. My Sociology degree is something I apply daily, without realizing it! Sociology is the study of the development, structure, and functioning of human society. Classrooms are a microcosm of our society, and daily I was applying my knowledge to connect with my students and help lead them to success! First and foremost, my mother. Without her question, “What are you going to do with a Sociology degree?” I would never have pursued the field of education. I look up to strong, trailblazing women who look for ways to pursue paths to excellence. Being a leader, a wife, a mom, a daughter, a sister, and a friend are all titles I never want to slack on! I am inspired by women who are open and honest about what female leaders juggle, and their insight as to how to best navigate the path of being a female leader! We have a great group of women leaders at FLVS that have helped me along my 15-year journey (10 of which have been with FLVS); without their support, I wouldn’t be where I am today. 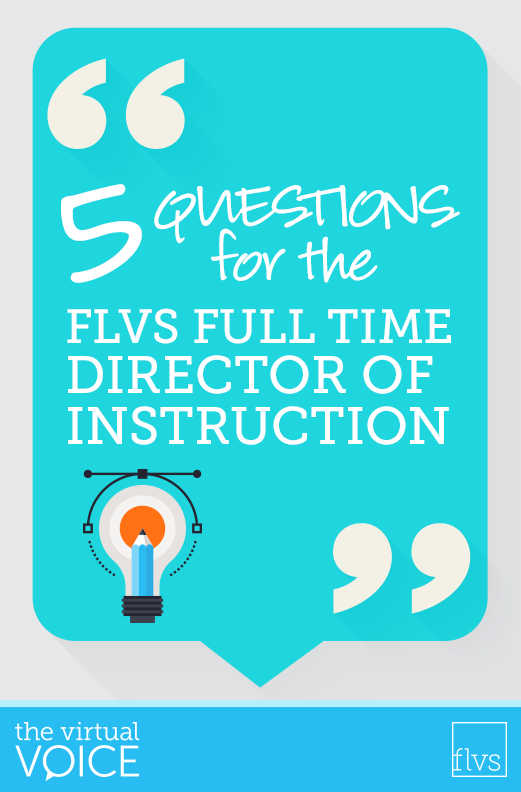 What do you enjoy most about being the FLVS Director of Instruction? I most enjoy seeing our teachers find new ways to impact our students and support their success. Having worked for FLVS over the past 10 years, I have truly loved knowing, watching, and participating in all that we do to provide families with an option outside of the traditional school setting for the many students and their varying needs. What are the best three things you think you’ve done since you’ve become the Director of Instruction? How do you like to relax after a long day of supporting students and teachers? I enjoy spending time with my husband and our children. We love to spend time at the beach and traveling whenever we can! When staying at home, we watch movies, Netflix, and anything on Bravo! Why not ask your teacher(s) one of the 5 questions above? Get to know the instructor who is working for your success! This entry was posted in Educator Edition, Full Time Edition, Homeschool Edition, Parent Edition, Student Edition and tagged #TeamFLVS, Careers, Careers at FLVS, Director of Education, Education, Educational Leadership, FLVS Full Time, FLVS Instruction, FLVS Staff, HR, Jobs at FLVS, Meet FLVS Staff, Meet Your Teacher, Online Education, Online instruction, Professional Development, Staff Interviews, Teach Online, Teaching Careers, Teaching Online, Teambuilding, Teamwork, Virtual instruction, Working at FLVS on October 27, 2016 by Dr. Jeanne Giardino.